Tommee Tippee Feeding Bottle - 340 ml | Blue | Natural feel teat for "just like Mum" feedings. Save AED 12 (26.67%) – Earn 3 Shukrans What is Shukran? Shukran is the Landmark Group’s award-winning loyalty programme in the Middle East, which allows you to earn Shukrans when you shop any of our brands. 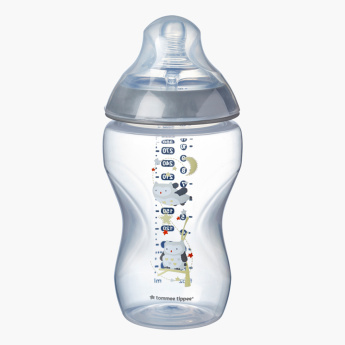 Help your little one transition effortlessly from breast to bottle with this ergonomic piece. It is enhanced with a natural-feel teat for 'just like mum feeding', and is easy to latch onto and feed. 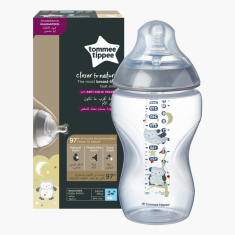 Feature 1 : Natural feel teat for "just like Mum" feedings. Feature 3 : Easy latch teat for smooth transition between breast and bottle.